Bookings are now made using ticketing platform Helm. You will be prompted to create an account with Helm, or you may checkout as a guest and make secure payments through the site. After selecting the event(s) you wish to book, at checkout you will need to enter details of each participant. Click on each individual event for full details, including fees. Payment for all workshops is due in advance and at the time of booking. If making a booking within 48 hours of an event, please contact us to check availability of places. Please note that fees for some courses will be higher due to limited spaces available and/or higher costs incurred for the venue, additional specialist tutors and accompanists. ​Please check the specific listing for your course where we will tell you if a supplementary fee applies. Half day workshops are self-contained three hour sessions which each have a different theme and are therefore chargeable as separate events. Extended care is available between 8.30am – 6.00pm @£1.50 per 15 minutes. To book extended care, please download and fill in the Extended Hours Booking Form and return to us by email at bathstringsacademy@gmail.com. Payment details are provided on the form. Bursaries are available for all of our workshops. Click here for more information, or contact us in confidence to discuss your needs. If your instrumental teacher is a member of the European String Teacher's Association (ESTA), you may also be eligible for funding for Chamber Music Workshops and Summer School Chamber Music Strand, through the Joan Dickson Fund. 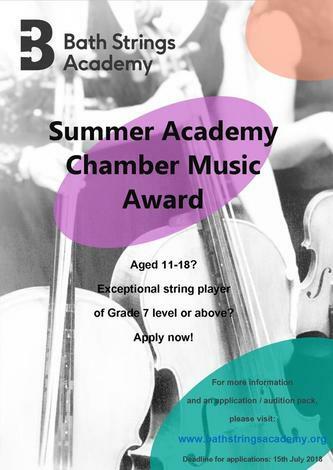 Bath Strings Academy is offering Chamber Music Awards for exceptional musicians aged 11—18 who demonstrate a passion for, and a strong commitment to musical study. Applications are invited from players of the violin, viola, ‘cello or double bass, playing at Grade 7 level or above; awards are made on the basis of audition and a written application. Awards include a subsidised place on the Chamber Music Strand of our Summer Academy with coaching from members of the Villiers String Quartet, and additional chamber music coaching sessions. Applications are welcome from individuals or pre-existing groups. ​More experienced players may apply to be a mentor at our workshops. Read more here. We will retain for our records the details submitted on this form along with any information provided on our New Participants Form and/or via our third party event booking system. These details will be used by us to keep any records as prescribed by the law. In addition we will use the information provided to plan our workshops. Retention of your information will allow you to make repeat bookings without the necessity to re-submit New Participant forms each time. Unless you indicate to us otherwise, your email address will be used to send booking confirmations and thereafter only to send occasional marketing emails which keep you informed of our future events. We will never pass on your information to a third party and any information we do keep will be stored on a password protected laptop. If you wish to opt out of receiving marketing emails, you can do so by sending us an email.